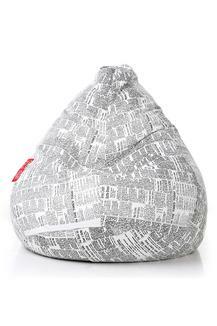 Featuring a classy design, this bean bag with fillers from Style Homez will upgrade the interior setting of your room. It features a newspaper print which looks fantastic and elegant. Furthermore, it is crafted with a good quality of cotton canvas material which feels great and comfortable. Dimension - 71 X 71 X 102 cms. Add this beautiful bean bag to your living room and lighten it up.